It is cold outside! Seriously, freezing…So I decided to exercise by the fire this evening. I exercise regularly, and I think it’s fun to change things up from time to time. After having bronchitis for a few weeks this month, I am finally feeling better. I’ve been on my recumbent bike and hit the treadmill, but I’d like to add some variety to the rotation so I’m trying a couple exercise videos. I’ve heard a lot about Jillian Michaels’ 30-Day Shred, and when my friend mentioned that she received it for Christmas, I went out and bought it too. We started it together yesterday, and while I wasn’t sure I could do it, I’m glad I did. It was not easy, but it was not impossible. I did everything that Jillian said to do, and I’ll do it again tonight. I’m going to do it for a total of 30 days then do an assessment. I’m sure the results will be great because I can feel it today. Another friend came over today after work, and we ‘partied off the pounds’ with Richard Simmons. What can I say? I love that man, and I believe that he truly wants me to succeed. And while his video was on, I forgot that I was exercising. Yay! So…in addition to my regular trips the the gym and cardio at home, I’m going to add some new and exciting videos to my exercise routine. I hope to see positive results. Do you use exercise videos? If so, do you have a favorite video? What do you do when you want to change your workout routine? I also looooooooooove the 30 Day Shred. But I can't do anything 30 days in a row, no matter how I love it, because it bores me to pieces. So I will do the Shred when I am short on time. I am always completely amazed at how incredibly sweaty I will get in less than half an hour. That Jillian really knows how to pack it in. 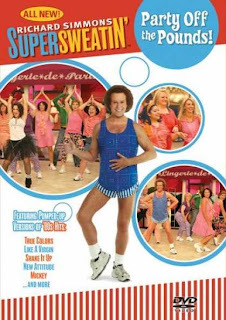 I just bought another (older, I think) BL workout video, as well as something called "Yoga for Inflexible People" (ha ha ha) which I am not sure I will ever use. I have used Tae Bo and The Firm…but I have a really hard time with exercise videos. It's not as fun just in your living room as it looks like it would be in a class full of people doing it. I don't know. They're hard for me to stick with! One of my favorite things I did that was different than just my regular running was water aerobics! LOVED it! I love the Shred too but like foody above I can't do it day after day because I get bored by it. I need variation. So like her it's my fall back workout when I'm short on time. But I do love it. Hey, ready for day 3? I'm excited and already planning where and how I'm going to do it when I'm gone for 3 days! I will not have internet access so I cannot check in, but believe me I will be thinking about you and shredding away! Literally, I hope! I have a variety of exercise dvd's. I like to mix it up. If this was 30 days just 1 level, I would probably get bored. I know what you mean about the jumping jacks. I'm bigger on top, and it just hurts!